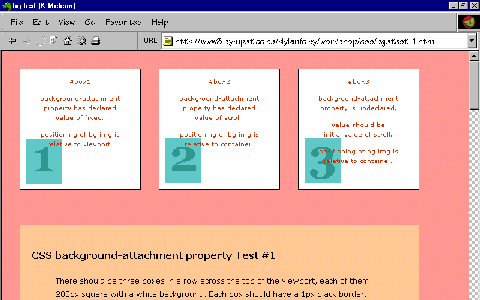 Each box should have a small background image in the lower left hand corner. They should be 10px away from the bottom and left edges. And they should stay there. 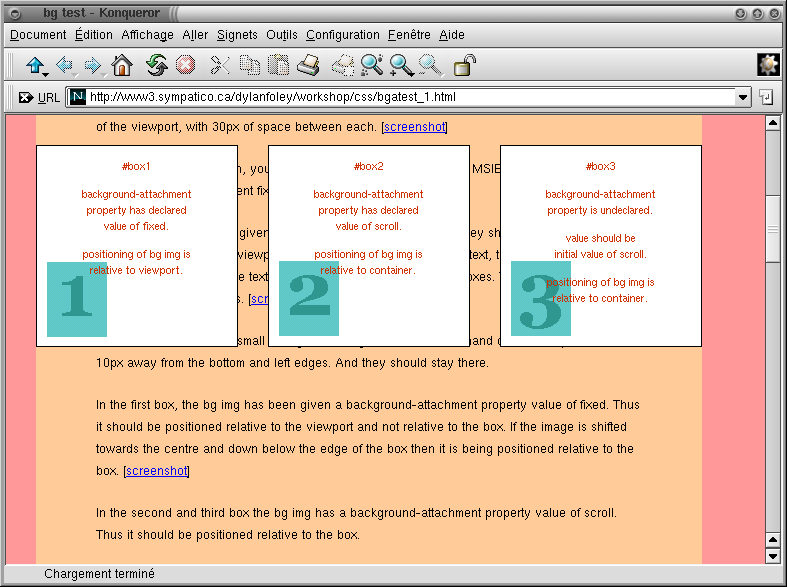 In the second and third box the bg img has a background-attachment property value of scroll. Thus it should be positioned relative to the box. In the next test the boxes are given a position property of absolute. 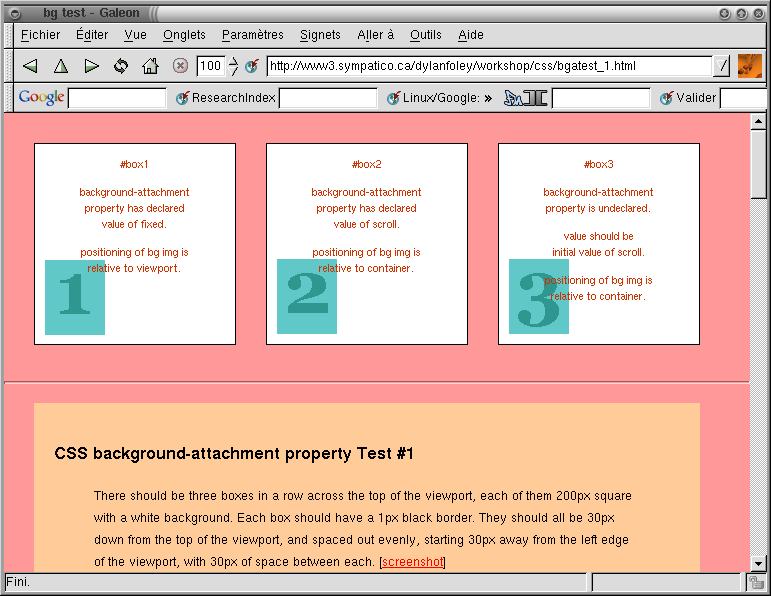 Note: You may also use the shorthand background property to set all the background properties at once. I have set them out separately for clarity. For example for the first box the following background property declaration would achieve the same effect. 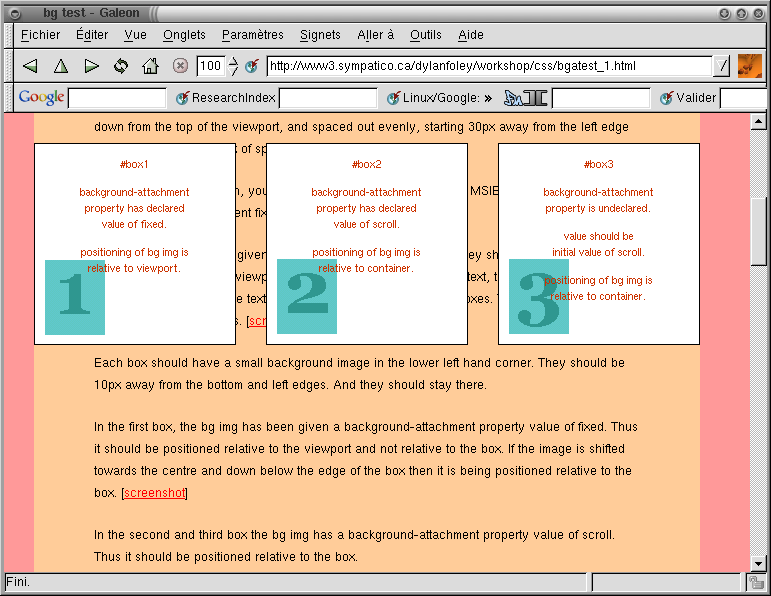 Opera 6 positions all three boxes correctly. 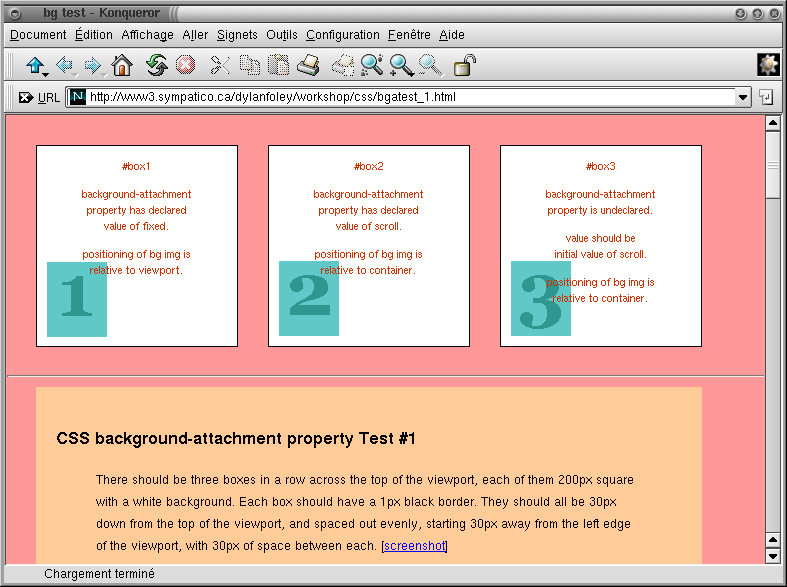 All 3 bg images are positioned relative to the boxes - bg image #1 is wrong. [screenshot] The second two bg images scroll with the canvas, which is also wrong. [screenshot] These two bg images should remain positioned relative to their parent element, which in this case is the box they are asociated with. K-Meleon v0.6 nails it. Every thing appears correct here. K-meleon is based on the Mozilla .9.5 milestone. Thanks to Stephane Gourichon, we can say that Galeon-0.12.1-2mdk(mozilla 0.9.4) gets it right [screenshots 1 2], Konqueror 2.2.1 also does fine with its own engine [screenshots 1 2], and Opera 5.0 fails just like Opera 6 on Windows. All on Linux 2.4.8-34.1mdk/Mandrake Linux release 8.1 (Vitamin) for i586. do all three bg images remain fixed in their position.